Tested on several parameters of quality, the offered Marketing Office is made available in several specifications as per the needs laid down by patrons. This office is manufactured with the use of excellent quality components and highly advanced techniques. We design, supply and build the Marketing office of any size and height to suit the requirements of our esteemed customers. The client can availed these offices from us at competitive prices. With sheer dedication to provide excellent quality products, we have been successfully engaged in offering optimum quality Portable Site Office. 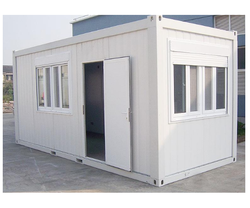 This office is portable and is used for temporary residence of workers at construction sites or other industrial projects. It is fabricated from deft professionals with the use of supreme quality raw materials and contemporary techniques. Moreover, our clients can purchase this office at reasonable prices from us. Clients can avail from us the best quality array of Sample Flat that is made available in different specifications as per demanding needs of clients. Using supreme quality components and the contemporary techniques, this flat is manufactured with the implication of advanced techniques at our advanced manufacturing unit. This flat is based on prefabrication methodology and suits best for residence and accommodation purpose. Additionally, our entire gamut of flat is put forward at marginal rates. Speedy Construction. Saves construction time by almost 50% compared to conventional construction. Lighter than other framing materials. Straight walls and Square corners. Various finish available as per customer's desire. Our company is providing Sample Flat/ Marketing Office Solution, which comes with Light Gauge Steel Framing (LGSF) structures. This comprises of structural wall frames, roof trusses and floor joists that come with cold-formed steel sections. The sheets surface of sample flat or marketing office is coated with zinc alloy that protects from corrosion completely. In this, there is a variety of option for external cladding such as, ACP, cement boards, sidings and many more. Roofing comes with insulation that provides a soothing ambiance in the building structure. The use LGSF enhances the acoustic and thermal insulation. 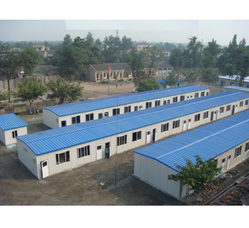 We are one of the profound manufacturer and supplier of Marketing Office, Prefabricated Marketing office from India. Our offered Prefabricated marketing offices are manufactured high-quality raw material procured from the reliable vendor as per the industry standards. The client can availed these product from us at competitive prices. 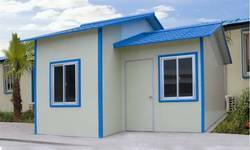 Tested on several parameters of quality, the offered Modular Site Office ismade available in several specifications as per the needs laid down by the patrons. This office is manufactured with the use of excellent quality components and highly advanced techniques. This is a special purpose prefabricated structure specially used in commercial places to establish marketing department. 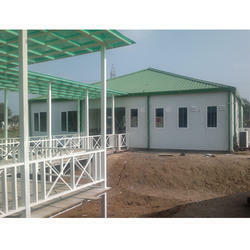 Besides, we are putting forward this office at highly competitive prices to the patrons. Taking quality as our prime concern, we are offering the best quality array of Prefab Site Office to our esteemed clients. This office is fabricated with the use of optimum quality raw materials and highly advanced techniques under the supervision of our deft professionals. 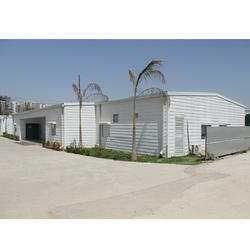 This office is used for residence and accommodation of employees at industrial sites. Besides, we are putting forward this office at highly competitive rates for our clients. 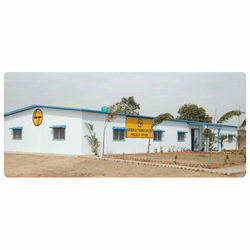 We are one of the reliable manufacturer and supplier of Site Office. Our offered site office are manufactured from high quality raw material procured from the reliable vendor as per the industry standards. Moreover client can availed these product from us at competitive prices. The company is known for building clean room structures that is widely installed in several applications such as pharmaceuticals, medical devices, electronics, automobiles, food, nutraceutical & food ingredients, paint or coating booth and R&D. We provide clean room solutions beginning for enclosures and interface with the HVAC, electrical, and civil vendors at the design stage. These are compatible for the approval from regulatory bodies, which are USFDA, WHO and EUGMP.